Growing habits: Thysanolaena maxima is a fast growing, luxuriant foliage, clumping, ornamental grass that will add a tropical look and feel to your garden. 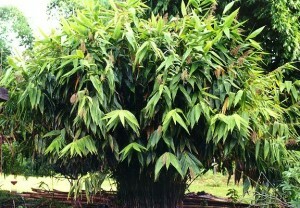 It grows to 3m in height in a tight clump. It makes a great hedge and also looks good alone or mixed in your garden amongst palms, bamboos and other tropical plants. It can also grow in pots and tight garden beds. Cultivation: Plant in to well drained soil. Water regularly, especially when young. Fertilize 2-3 times per year with high nitrogen grass fertilizer. Uses. You can cut it back to the ground every 3-4 years to refresh the plat if needed. Try it in a hedge around the pool area – you won’t be disappointed!